A video of a man claiming discrimination after being stopped and searched by police in Bogota has captured the attention of millions online, prompting a discussion about racial divisions in Colombia. At 8 a.m. one Monday, Carlos Angulo was walking to work when he says he heard a policeman shout a racial slur at him. The officer ordered him him to stop and submit to a search. He decided he'd had enough. He threw his backpack on the ground and started emptying its contents, throwing them around while screaming and pointing at other people: "Why don't you search them? Because they are white!" "Why don't you ask them for their papers? Because they are from the capital city and they are not considered dangerous. 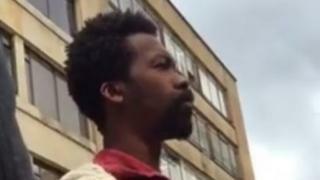 Hundreds of people pass by and you stop the only two black guys on the street," he screamed. "You think I'm suspicious because I'm going too fast and my boss thinks it suspicious when I'm late." The resulting video of the encounter has been viewed more than 5.4 million times on Facebook. Angulo, 33, works as a carpenter. Ten years ago he left his hometown on Colombia's Pacific coast for better educational and job opportunities. Colombia's black population - 11% of the country at the last census - is concentrated in the coastal areas, as opposed to inland Bogota which has a smaller Afro-Colombian minority. Angulo told BBC Trending that since moving to the capital, he has been repeatedly stopped and searched by police: "This is not the first time I have had a confrontation with the authorities." But it is the first time someone has filmed him being searched and posted it online. "The girl who uploaded the video told me that she was going to help me," he added. That person was 19-year-old Maria Alejandra Pulido. "It's about time that someone finally stood up to the authorities," she wrote on her post. "No more discrimination in Colombia! No more abuse of power! Share this and help him have his rights respected." According to Aurora Vergara, head of the Centre of Studies on the African Diaspora, part of the video's appeal is the recent debate over race and policing in the United States. The Black Lives Matter movement, spread through social media in the US, has had an impact in Colombia too. "It has led people to identify acts against Afro-Colombians as acts of racism and discrimination," she says. Last July, for instance, a video of a woman shouting at a black taxi driver sparked public outrage. Nevertheless, Vergara says that discussion of racism in Colombia is still not part of everyday conversation. "To speak about racism and racial injustice in Colombia is like shouting that the emperor isn't wearing any clothes," she says. In her view, "Colombia has a tradition of racial supremacy in which it is good to be white or to act like white people." But the video sparked a debate as hundreds of thousands shared it on Facebook. "Everywhere racism against black people is horrible," said Rosalinda Guillen. "We have to join forces to stop this." But others took a different view. Alvaro Toro said: "I'm not racist but there must be a reason why they stopped him, regardless of his origins." Angulo now admits that he reacted badly to the police, shouting and swearing. "But the reason I lost control is because of the way the police treated me," he says. He was released by police, but Angulo has now filed a complaint against the officer who stopped him. Speaking to BBC Mundo, a spokesperson for the Metropolitan Police of Bogota said they were investigating the incident, but that they deny any discrimination towards people of African origin.